Whether your floor is carpeted or tiled, the area under your chairs gets the most abuse! 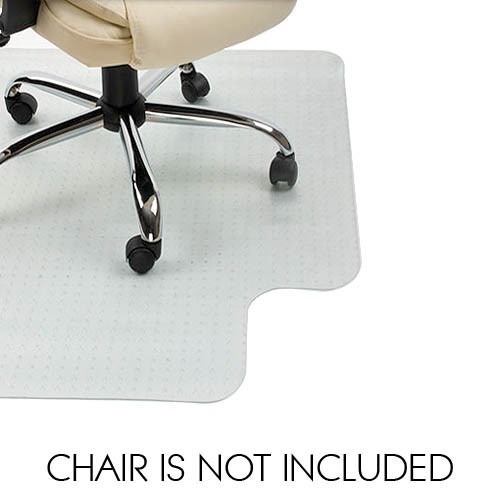 Reduce stress caused by swivelling and wheeling over the floor simply by using a chair mat. 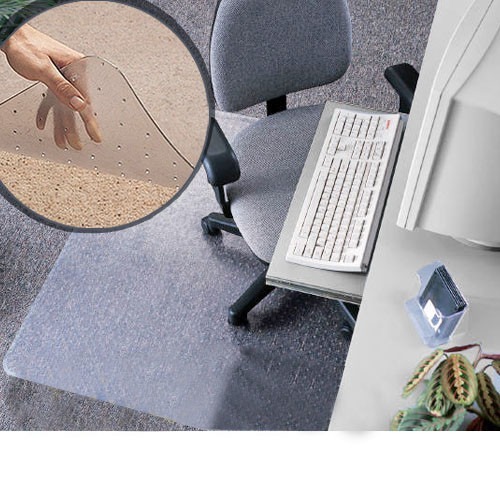 The textured mat surface resists scuffs and scratches. 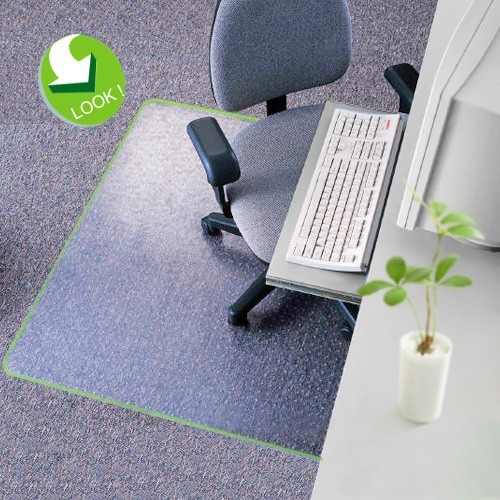 An easy solution to protect your floors, grab a chair mat for your floors. Your mat has been rolled to allow economical and timely delivery. When vinyl mats are rolled they take on a “memory”” of that rolled shape and may be difficult to unroll when cold. 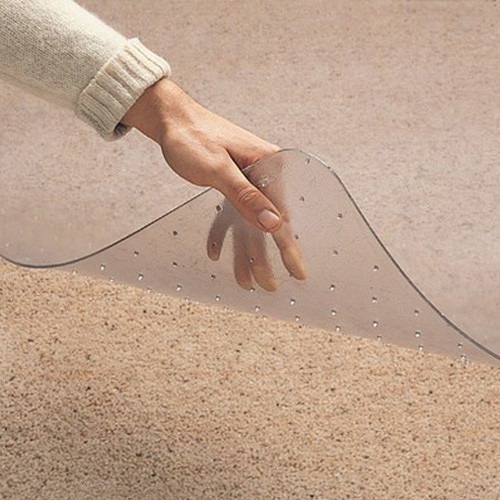 The following precautions will protect your mat from cracking while enabling you to put it to use as soon as possible.Vinyl becomes more pliable with heat, so the warmer the mat the quicker it will lay flat. Also, the thicker the mat, the longer it will take for the mat to lay flat. Always allow your mat to warm up thoroughly to (at least) room temperature before attempting to unroll your mat. (APPROX. 24 HOURS) After the mat has warmed up, carefully unroll it and place it on the floor with the “bow” up (studs/cleats down), adding weight to hold the mat in place if necessary.The mat should gradually flatten over a period of a few hours ( thicker mats could take longer). ADDITIONAL OPTIONS FOR UNROLLING YOUR MAT Option #1 Try placing it in a small warm room (maybe a bathroom) or near a sunny window. Ideally once the temperature reaches approximately 80 degrees the mat will begin to relax quicker. At that point you can lay it flat bow side up. Add weight on top of the mat as needed. Option #2 Warm Weather Method Place your mat on a smooth flat surface outside in the sun on a warm sunny day until it flattens (check it every 15 minutes). After it relaxes and is flat move it to a flat cooler area (in the shade or indoors) until it cools and becomes more rigid. 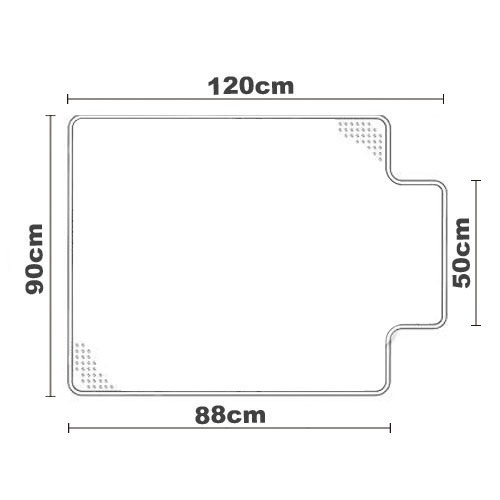 Now your mat is ready for installation. 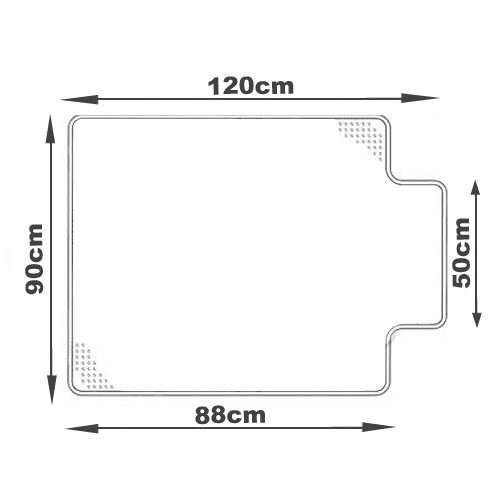 When you buy a Brand New Office Chair Carpet Mat 900 x 1200mm online from Temple & Webster in Australia, we make it as easy as possible for you to find out when your product will be delivered to your home in Melbourne, Sydney or any major city. You can check on a delivery estimate for the DwellHome Part #: ChairMat-TW-C-90 here. If you have any questions about your purchase or any other Desk Accessories product for sale our customer service representatives are available to help.Whether you just want to buy a Brand New Office Chair Carpet Mat 900 x 1200mm or shop for your entire home, Temple & Webster has a zillion things home.